How do you find any magazines that are ready for the iPad? Discussion in 'iPad General Discussions' started by iVegas702, Apr 5, 2010. Great question...been looking for the iPad ready version of "Wired" that was shown on the apple video. They currently have an iPod/iPhone application and are said to be working on a iPad version. I',ve have several subscriptions on my iPhone and love it.. Thanks for the info. I just did a search on the app store and there is an iPad version. I know you can have subscriptions on the Kindle - do they work on the iPad? Thanks CaptKirk, great find, very helpful. cool, i didn't realize they were going to get the iPad version out this quick. I'll be down loading tonight.. There are several free subscriptions you can use to check out the service. I love it... i think you will too. 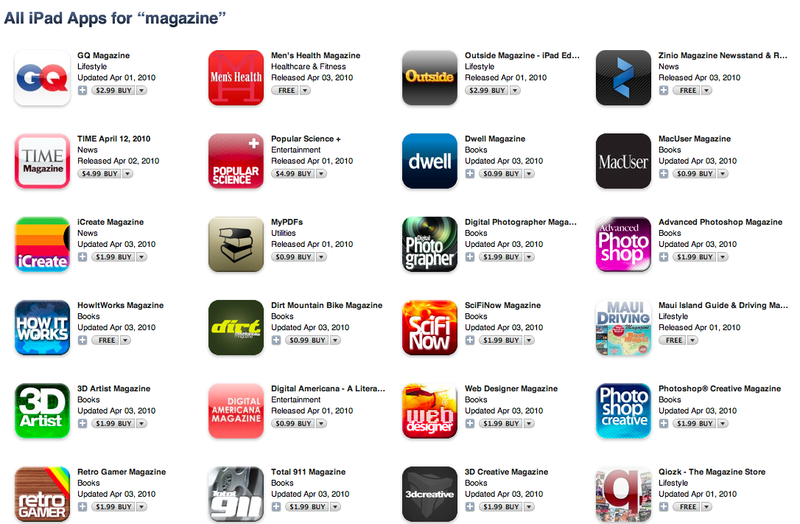 From the iTunes store, search for "Magazine" and look in the section "iPad Apps". I wasn't able to find a separate category for them either. You are right, I just checked out the free samples and this is definitely something I am going to use. The few prices I have checked out seem reasonable to me too. Thanks again . This article was on NY Times site today on iPad magazines.